You love these dorm pillowcases. We know. These College Pillowcases - Han & Leia are must have dorm items for any Star Wars fan. You'll be putting Star Wars dorm posters on your dorm walls to add to your dorm room decorations - why not do the same for your dorm bedding? The expression of your love of Star Wars doesn't have to be limited to your T-Shirts or dorm posters. Your Twin XL Bedding is just as important as the dorm wall art on your walls, so complete your Star Wars dorm room decorations with our College Pillowcases - Han & Leia. 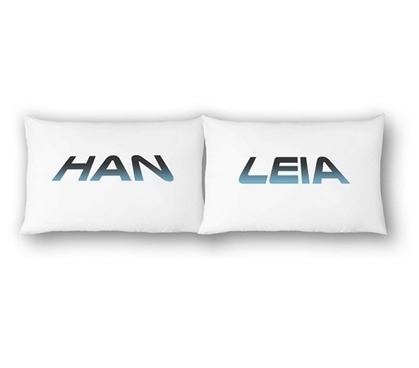 Our College Pillowcases - Han & Leia feature their names in the famous Start Wars style scrolling script that every fan knows and loves. Plus, with a blue color theme on a white backdrop, you don't have to worry about it clashing with your other dorm room decor dorm essentials. However, these are some pretty awesome Star Wars dorm pillowcases so who cares if they do or do not (see what we did there?) go with your other dorm room decorations - they are simply must have dorm items. Of course, you also want comfort from these basic dorm supplies too, and while these dorm bedding essentials add some extra awesome fandom expression to your dorm room decor, they will also make your Twin XL Bedding comfy with super soft 100% cotton.